Microsoft Surface Laptop 2 review: The best Windows laptop? The Surface Laptop 2 is one of the best premium ultraportables out there. Just like its predecessor it's gorgeous to look at and incredibly well built. Only this time it comes with full Windows 10 off the bat, plus more power than before. The biggest downside is the lack of USB-C, otherwise it's near perfect. 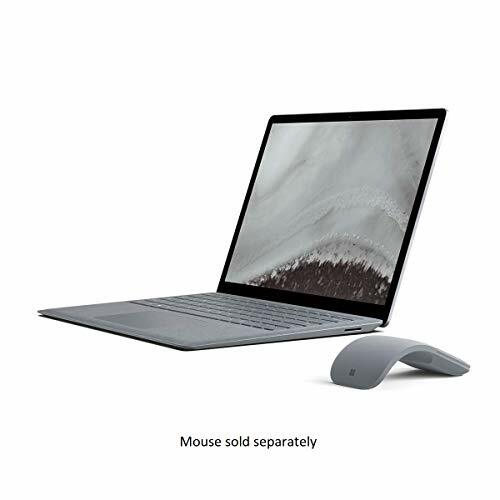 The original Surface Laptop addressed a demand for a more traditional, clamshell laptop version of Microsoft's Surface devices. And we thought the original was the best laptop of 2017, bagging the Pocket-lint Gadget Award in the category. There's also the Surface Book 2 which has succeeded for some, but the detachable tablet part of that device does make it expensive, while its spec list is designed to smash up the MacBook Pro rather than being designed for out-and-out portability like the Laptop. The Surface Laptop is a far more portable device for working on the move and doesn't come with the key compromise of a 2-in-1 device like the Surface Pro 6; instead it can be used on a lap or seatback train table rather than needing space for a kickstand as is the case with 2-in-1s. Microsoft Surface Pro 6 vs Surface Laptop 2 vs Surface Book 2: What's the difference? For 2018 Microsoft has thankfully abandoned providing the Surface Laptop with Windows 10 S – it runs full Windows 10 Home or Windows 10 Pro, making it a better fit in the series. However, with stiffer competition than ever – there's the Dell XPS 13 and Huawei MateBook X Pro providing the most formidable competition, while the new MacBook Air is hoping to keep users tempted by OS X – is the sequel Surface Laptop still the hottest Windows laptop around? Aside from a new black option, the Surface Laptop 2 retains the same design as the original. Clearly Microsoft felt it wasn't worth redesigning the chassis for this release. As a result the connectivity remains the same, which is one of the main talking points about this device. That's because Microsoft has dealt a controversial hand by eschewing USB-C and opting for a single full-sized USB port and a mini DisplayPort. The fact the Laptop 2 doesn't have at least one USB-C port is unfortunate at this price and Microsoft's protestations that users don't mind flies in the face of Microsoft having included one on Surface Book 2 and the far cheaper Surface Go. It also means that Surface Laptop 2 isn't compatible with Thunderbolt 3 for fast data transfer with compatible peripherals. Has there been some cost-saving here by using last year's design? Perhaps. Is USB-C frustrating for some who regularly use legacy devices? It can be. Still, in the interest of being future-proof we think the ports aren't quite right. Really, we want the 2019 version of this laptop to move toward having at least two Thunderbolt 3-capable USB-C ports just like the MacBook Air and Dell XPS 13, with the capability of being able to charge via USB-C (not the proprietary Surface connector as used here). Which Microsoft Surface device is best for you? That grumble out of the way, the overall impression of the Laptop 2 is one of quality. It's distinctive. Many ultraportable PCs are somewhat lacking in terms of design, which is why the Alcantara microfabric keyboard surround is different and attractive. It's also divisive: yes it's lovely and soft against the wrists as you type and mouse around using the ample (yet not the biggest) trackpad, but we still have reservations over what it will look like after a few years of use. However, reports from those with previous Surface Laptops and Alcantara-covered Surface type covers are overwhelmingly positive. Surface devices have been renowned for their excellent keyboards and there's no exception here. There's plenty of travel with the keys and it's a clear advantage over the MacBook Air in terms of comfort – the Apple device has given us issues with missing letters due to the typing style and is a very noisy keyboard compared to the Microsoft setup – although it's not especially quiet, so court reporters and quiet carriage regulars will want to look elsewhere. The Surface Laptop 2's screen is unchanged from the original model's display, sticking to the familiar Surface family trait of having a 3:2 aspect ratio screen rather than the 16:9 ratio you see in many other places. It is good for document-based work, especially when side-by-siding pages, less designed for widescreen multimedia use only. The ratio means it's a 13.5-inch screen rather than a 13.3-inch one. The panel is high resolution and has excellent colour and contrast (black on white documents look especially crisp). No, it's not quite as pixel-dense as the new MacBook Air's panel, but it'd be splitting hairs to suggest it would actually makes a genuine difference in use between either device. Of course, being a Surface device there's excellent touch capability – something the Mac lacks entirely – while you can use the Surface Pen stylus with it and therefore Windows Ink. The screen bends back to around 45 degrees, which is OK for stylus input but it's not great for precision work because it will move. Thus you won't be able to use Surface Laptop as a sketchpad as with other Surface devices. Where touch on a laptop like this is useful is for doing things like flicking through photo galleries. Being 2018, Microsoft has gone with Intel's 8th Gen Core i processors. The key choice, we think, is the Core i5 8250U – which offers some advantages over the i5-8210Y inside the MacBook Air (both have integrated Intel UHD graphics), as it's a quad-core processor with eight threads as opposed to the dual-core lower-voltage chip in the Air. In terms of out-and-out performance, there's only one winner: the Surface Laptop beats the Air and functions much like the Dell XPS 13 with like-for-like specs. With the base configuration of the Surface Laptop 2 you also get 8GB RAM and a 128GB SSD. For our money, you need 256GB in a laptop like this, but if you store a lot in the cloud then that might not be necessary. You can also opt for the Core i7-8650U which has a significantly better turbo frequency. Again it's a quad-core, eight thread chip with the same Intel UHD Graphics 620 integrated graphics. But it puts the price up: you can't configure it with a 128GB SSD for starters, so comparing the prices for the 256GB model shows that the Core i7 premium is £300. We think that'll be hard to justify for many. In terms of battery life we found we got at least eight hours of standard use, sometimes pushing nine. You might be able to squeeze a little bit more out of it than that, but it's not that practical to do so if dimming the screen and throttling things. Besides, that puts the Laptop 2 on par with the original model and we think a full working day's innings is good cop from a machine such as this. The Surface Laptop 2 is one of the best premium ultraportables out there. Just like its predecessor it's gorgeous to look at and incredibly well built. Only this time it comes with full Windows 10 off the bat, plus more power than before. The Core i5 version represents good value – indeed it even undercuts Dell's XPS 13 by £200 in its entry configuration, which makes the Surface Laptop 2 a very compelling proposition indeed. The only real downside is that time moves fast, thus the 2018 Surface Laptop lacking any USB-C port is rather irritating and a definite black mark against its name. Sure, many don't consider it important currently – but in two or three years time it will be an essential. If the connectivity doesn't matter to you, however, then Surface Laptop 2 is a glorious Windows 10 laptop. It's significantly better value and has a better keyboard than the MacBook Air, too. The Dell XPS 13 is a lot thinner than the last version, and has a neat new fingerprint scanner built into the power button. You do trade a little battery life compared to the Microsoft, but it's still among our favourite ultraportables. If you're after a high-quality laptop with a touchscreen and 360-degree hinge, look to the Yoga 920. It comes with a neat stylus for scribblers and designers. One of the best Windows laptops going, the MateBook X Pro has the slimmest bezel in the business, oodles of power, and even discrete graphics on board. The battery life is also comparable to the Surface Laptop 2. It's quite hard to find in the shops though.